Suskinder - Chapter 1 – Food culture and eating habits – where do they come from? Home>E-learning>Module 1 – The key role of kindergarten staff to change food habits>Unit 1 – Key role of kindergarten staff for developing food culture und eating habits>Chapter 1 – Food culture and eating habits – where do they come from? The eating habits children practice early in life affects their health and nutrition and is formative to shape food attitudes and eating patterns through adulthood. Research in the nutritional situation of children have shown that there is a need for action. At kindergarten level, the offering, presentation and pedagogical guidance of food can help to path the way for developing healthy eating habits. Eating together promotes a sense of belonging together and brings a positive influence into group dynamics. Taste, food quality, atmosphere and attentiveness are the fundaments for enjoying food and drink and each other's company. Therefor common meals have a prominent place in the day-structure of kindergartens. Adults eating habits, values and attitudes regarding food affect their expectations to children´s eating behavior, the rules and rituals in kindergartens are established. There are different expectations, doctrines and ideologies from parents and kindergarten staff about food quality (e.g. about what´s healthy or unhealthy, tasty, enough, sustainable, fair trade, less wastage …) and eating manner (how to eat in a proper and decent way). How adults see these things, is often affected by knowhow and information but also by old behavioral patterns or their religious, cultural and individual background. A mutual reflection considering food culture and eating habits, that are established and lived in kindergarten is worthwhile to find out, what should remain and what should be changed in order to create healthy eating habits. A first step is to find out, which values and attitudes regarding food, eating behavior or table manners are important for each individual pedagogue or caregiver. After that, the staff can decide together what are the basic rules for all to follow and which common framework conditions are needed. questionnaire with discussion or presentation in the team. 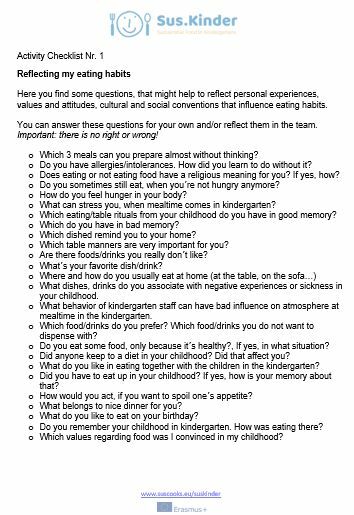 You find the leading questions in the checklist “Reflecting my eating habits”. Nutritional biography. 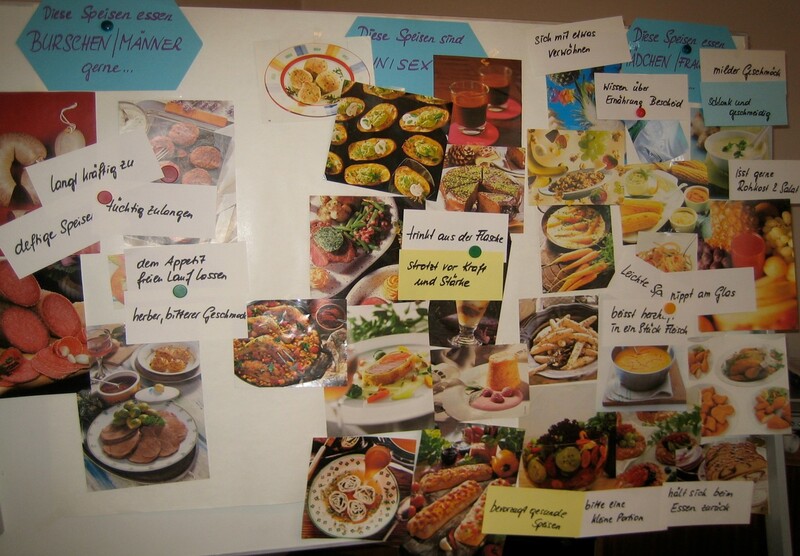 You find the guidance how to create and interpret a nutritional biography in the activity-sheet “Nutritional biography”. 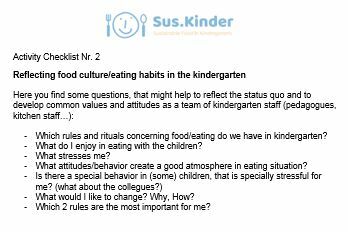 In the checklist “Reflecting food culture/eating habits in the kindergarten” you´ll find some questions, that might help to reflect the status quo and to develop common values and attitudes in your team of kindergarten staff (including pedagogues as well as kitchen staff). To be guest in another kindergarten, can be a fruitful exchange of experience concerning atmosphere in mealtime.